The Kidderminster Harriers manager, Mark Yates, pleased the Harriers fans in two ways today when he disposed of the disappointing midfield man, Dwaine Lee, to a gullible Stevenage Borough and then triumphed with the master stroke of bringing back the talisman from last season, Iyseden Christie, on a long term loan from Rochdale, the club he left us for in a joint deal with Mark Jackson at the end of January this year. Last time with us Christie banged in thirteen goals in thirty eight appearances and now he's back to knock some more in. There's no doubt that we need a decent striker with our current strikeforce of White, Reynolds and Sturridge having scored just twice this season with our only other goal coming from a full back, Jeff Kenna. Iyseden has not done so well at Rochdale and he has only notched twice in twenty outings with both of those coming last season. Now with the arrival of Keith Barker from Blackburn Rovers then Rochdale obviously thought they could do without him. Christie has told the official website that he could not cope with the travelling to Rochdale from Coventry everyday and is glad to be back at Aggborough. Dwaine Lee has never settled in here and in all his five games for us he never looked like living up to the comments from Barnet and Exeter City fans that he was a midfield maestro with a superb first touch. He has now signed for Stevenage and will probably do ok back in London. 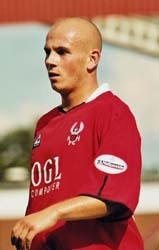 Another former Harrier on the move today was Adam Murray. The problematic midfielder was with us for two periods in the Autumn of 2002 and again more permanently for the first six months of 2004 but left mysteriously after a suspected bust up with Jan Molby over his 'problem'. He left us to re-join Mansfield and from there he went to Carlisle for an un-disclosed fee. Now he has teamed up with Ian Atkins at Torquay Utd for a fee of �10,000.